5 Favorites List, Hands down. 3 Like not love. It was ok.
2.5 This book had some big issues. DNF I couldn’t stand to turn another page. Sorry. Be honest. You have a “Me, Not You” rating. If you’re not being mean for the sake of being mean, go ahead and say, “You, not me,” without saying it that way. You know? They’re big boys and girls. They ought to be able to take it! I think this MNY rating is more about books that everyone raves about & rates highly but just didn’t work for you. Or a book that was written well, but there was a specific personal “sorespot” or “hard limit” that made you turn off to it w/o being able to finish. Or lastly, a book that you read and you can’t really describe what it was about it, it just didn’t work for you. Those are all “me not you”. I love this rating. It’s so entirely human to dislike a book for a reason you know other people might not understand. Honest and wonderful. Looking forward to the less than 5 star reviews. So many blogs hand out 5 stars to the majority of the books I start to wonder. They can’t all be that good! I know, right? Sometimes I feel like I’m not even reading the same book..? And it’s such a shame when a blog or reviewer loooves each and every book to pieces. Ultimately, the truly amazing books suffer from this ‘star inflation’. 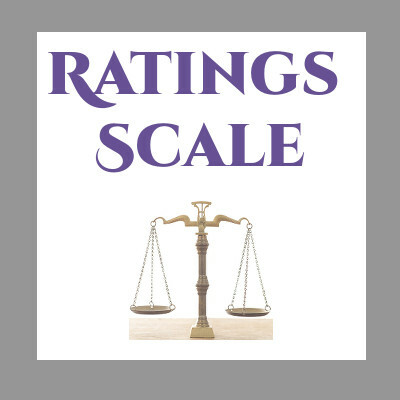 Thanks for posting the rating scale. I think this is helpful.